Snow White and the Huntsman isn't, frankly, very good: a burdensome, overproduced fantasy with a questionable casting decision in Kristen Stewart as the "fairest of them all". But, at least the film had its creative intentions in the right place, modifying the classic Brothers Grimm tale by reworking the central character into, ultimately, a capable heroine and conqueror of tyranny with the help of The Huntsman. The events of that original film left its universe in a state where crafting a direct sequel would be tricky -- and, considering the general response to the film, unnecessary -- which would prove challenging for whomever decided to continue the story. 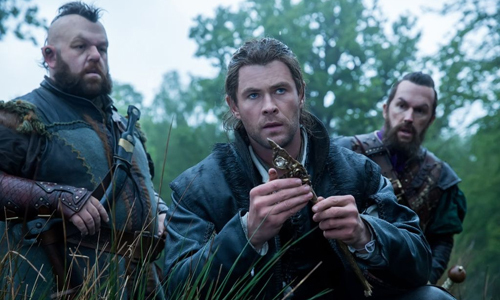 The Huntsman: Winter's War attempts just that, and while its predecessor holds deep flaws, they're not as profound as the lack of imagination and cumbersome modifications that went into building this new installment around the story before it, squandering robust talent and strong female characters within cobbled-together bits of familiar high fantasy. To piece together a workable story, Winter's War exists as both a prequel/origin story and a sequel to Snow White and The Huntsman, which one can either consider to be ambitious or simply too convoluted for its own good. At first, it depicts the rise of power of Ravenna, Charlize Theron's gold-plated enchantress and the villain from the first film, and how she shares a tender relationship with her then non-magical sister, Freya (Emily Blunt). A traumatizing event changes all that, though, awakening the frosty vengeance within Freya as she embarks to the North to create her own empire, amassing an army of orphaned children and forbidding any sort of love within her domain. Many years pass, arriving at a point some time before the events leading to Snow White's reign, introducing The Hunstman, Eric (Chris Hemsworth), and his bow-wielding contemporary, Sara (Jessica Chastain), both skilled warriors under her tutelage. Winter's War chronicles how they fell out of her good graces and ended up in the lands to the South, jumping ahead nearly a decade to account for Snow White and the Hunstman as a search for Ravenna's mirror escalates throughout the land. Nominated for an Oscar for his visual effects work in the first film, Cedric Nicolas-Troyan makes his feature-length directorial debut with Winter's War, working from a script penned by Hercules writer Evan Spiliotopoulos and The Hangover Part II and III's Craig Mazin. Their influences are clear, a little too clear, from the Game of Thrones-style conversations over chessboards and frosty training grounds to the broad shots of boats going downstream that look like deleted scenes from Fellowship of the Ring. That familiarity isn't helped by the rather blatant recycling of ice queens that went into creating the villainous Freya, who essentially acts the way you'd expect Elsa from Frozen to act had she well and truly "let it go" for years on end, only with the ruthless drive of a White Witch to keep her going. Winter's War expands upon the world from the first film in a maddening way: it appeals to the fandom of other franchises and series without an original bone in its body, while also trying to both exist alongside Snow White and The Huntsman and ignore certain elements that complicate it as a sequel. Amid thick accents, brave revolutionary personas, even moments of intimacy that all recall the likes of Braveheart, the talents of Chris Hemsworth and Jessica Chastain get lost in the borrowed clutter of Winter's War, a shame considering the unique chemistry that exists between their enamored warriors. In their quest to locate the mystical mirror, to which they're accompanied by a quirky band of male and female dwarves that injects a off-kilter sense of humor into the events, director Cedric Nicolas-Troyan finds one of the film's few strengths in the hardened flirtations and simmering anger between these two Huntsman who were driven apart by their ice queen's whims. Hemsworth's innate charm exchanges well with the stern, equally capable prowess of Chastain's Sara, almost making one wish that these characters existed independently from the history forced upon hem by Queen Freya's ludicrous reign. Winter's War finds its source of levity in Eric and Sara's trysts and clumsy interactions with their dwarven comrades, almost overcompensating for its absence in the previous film. Unfortunately, the story itself is a wash, stringing together authoritarian dominance and forced circumstance with the search for Ravenna's mirror. The atmosphere in Winter's War fits somewhere in the high-fantasy category: Freya can freeze people, raise ice walls, and see through the eyes of a frosty owl avatar, while mirrors can alter the consciousness of those within its visible range and goblins run around with flammable blood. All these things exist within the conditions of the crammed-together plot, though, and it's tough to ignore that these powerful enchantresses could've cast their spells to far more capable means, restrained only because the plot desperately needs its humans to look like an even match. 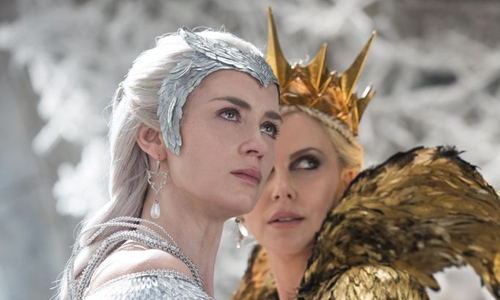 Even with Emily Blunt's wounded stoicism as the icy queen and Charlize Theron's hypnotic, velvety menace as Ravenna, the fickleness and lack of thought behind their powers result in a ridiculous antagonistic presence, made worse by the generally unremarkable machinations of their plays at power. As a fantasy-action film, Winter's War is merely functional, driven forward by less-than-enthralling visual effects with Oscar-nominated Cedric Nicolas-Troyan at the helm. Crackling ice walls and oozing gold and oily tendrils enliven those dubious scenes of magic use, while the hand-to-hand combat involving the Huntsmen move vigorously enough in taverns, woodland areas, and the frigid corners of Freya's realm. The scope and trajectory of the adventure leaves plenty to be desired, though, and that's largely due to the film's meandering priorities, losing itself in referential coexistence with Snow White and The Huntsman while hurling a Thor-esque Hemsworth into an endgame that the character himself deems "the worst plan ever". On the steam of the enduring power of love like a tried-and-true fairytale, The Huntsman: Winter's War crystallizes into a strangely perplexing entry in the genre once all's said and done, one with passably-made action and stabs at personality that, somehow, still ends up leaving one feeling about as cold as its predecessor does.